There is no doubt that Timber Cladding has world-wide appeal as Bennetts Timber recently received an order to supply a quantity of Western Red Cedar cladding to Jamestown, St. Helena. 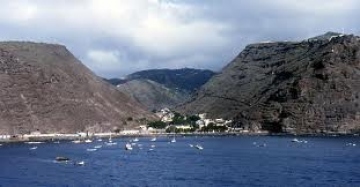 St. Helena is one of the remotest islands in the world, situated in the South Atlantic Ocean it covers an area of 47 square miles, has a population of 4,300 and is a British Overseas Territory. The only way to get to and from the island is currently by sea, although an airport is to be built. The timber cladding order was machined to the customer's specification in our modern mill facility in Grimsby and then delivered to Avonmouth before being containerised for shipping to the island. It will be used for external cladding once it arrives at its' distant location in the South Atlantic. Western Red Cedar is a fantastic material to use for external cladding. It has a contemporary feel yet is a classic building material which offers durability, versatility and resistance to weather. No man-made material can quite match its performance or attractive appearance. At Bennetts Timber we offer a wide range of of patterns and profiles for all Timber Cladding materials. Properly finished and maintained Western Red Cedar will give years of trouble free service. We are also able to provide factory finished stains, UV protectors and fire retardant coatings to your specification. Importantly, the Cedar that we supply is sourced from sustainably managed forests of western Canada and therefore has sound environmental credentials.